This is the time in Kindergarten when we start to work on comparing numbers activities and dig deeper into place value. Do you remember learning comparing numbers using the alligator signs from when you were little? I do! To introduce comparing numbers, I created this anchor chart using the alligator mouth to teach “greater than/less than”. I saw a similar anchor chart on Pinterest, but couldn’t find the original creator. I like this chart because it uses numbers and base 10 blocks to teach comparing numbers and place value. It’s a great visual for students to see why 12 is bigger than 3. It also seems that children remember this skill better when they think of the alligator eating the biggest number. This Number Gators video on Youtube is also a fun way to introduce comparing numbers! I found them on Amazon. They are dry-erase for students to fill in the numbers and then they can move the alligator mouth to show the correct sign. These would be fun to add to your comparing numbers activities. To start to learn how to compare numbers, I used this FREE Place Value comparison mat from KTP on TPT. I put students into pairs and gave them some shape manipulatives. Each student grabbed a handful of objects and counted them out. They had to write down the number they had and then fill in the bottom of the mat stating if the numbers were great than, less than, or equal to. Later on, we used the mat with base 10 blocks. I used this mClass Math DIBELS bundle each month to help students learn how to find missing numbers, compare numbers, and number fluency. Here’s the Winter version that I throw in centers for students to work on comparing numbers 1-20. 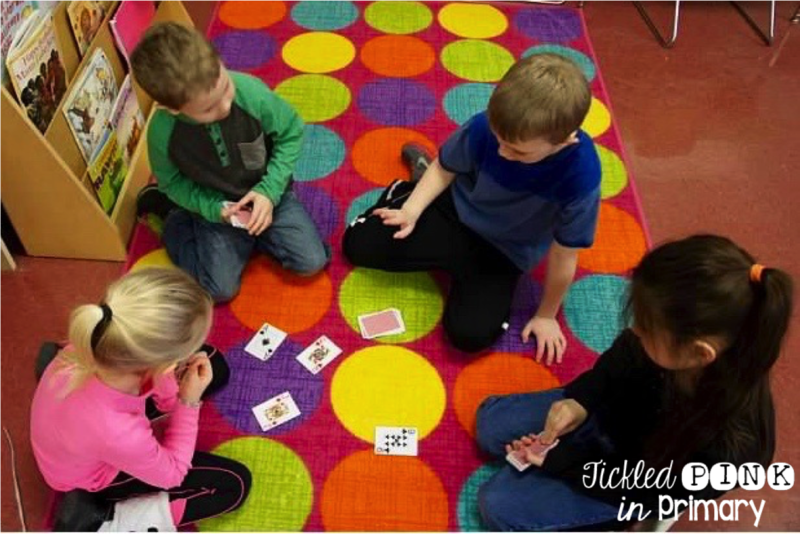 A favorite comparing numbers activities is the card game WAR. My students would even ask to play this during their free time at the end of the day. Since my class enjoyed playing WAR so much, I created this FREE Snowball Fight comparing numbers game to be played in math centers. Students have to flip over a number card and whoever has the highest number gets to add a snowball (cotton ball) to their snow fort. This works on numbers 1-50. If your class has mastered comparing numbers, you can try this Comparing Numbers Fluency & Fitness. It helps students work on comparing numbers and gives them a chance to get in some movement. It’s a Powerpoint slideshow that you simply project onto your wall. Click through the slides and students can either say the biggest number or if they’re ready they can say what sign would go in the bubble. When they see an exercise kid, they get to do that exercise until you decide to switch to the next slide. Students LOVE doing these Fluency & Fitness activities because they don’t even realize they are learning – they think it’s just a fun brain break!! You can find all my Fluency & Fitness® sets here on my Tickled Pink Shop or in my TPT store. There are some affiliate links in this post to help you easily find the materials mentioned in this post.